Djworking Unlimited Inc., 9780983697046, 306pp. Alternately humorous and poignant, this inspiring memoir chronicles the author's misadventures as she and her husband cook in quirky kitchens, struggle to speak French and shop like locals in outdoor markets. With candor and optimism, Deborah Jacobs transports readers from the grape harvest in the Loire Valley to an exuberant chile pepper festival in Basque Country and, ultimately, to Paris, where she witnesses history in the making. En route, she does the pintxo bar crawl in San Sebasti n, Spain, develops an affinity for sheep's milk cheese and cultivates new friendships. Four Seasons in a Day, an expression used to describe the changeable weather in the Pyrenees, also captures the author's extreme resilience. Her grit and determination in the face of every obstacle give us the courage to chart our own course, carve out a new life and embrace the unexpected. Those who are thinking of using their home to subsidize foreign travel will find several chapters showing how to do that. 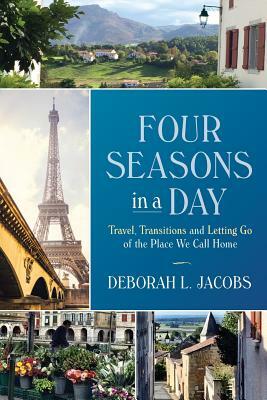 Others will whet the reader's appetite to explore the places Jacobs visited. Anyone who has ever fantasized about taking a break from the rat race will want to follow the thread in the style of the 2009 film Julie & Julia of how this life-transforming journey became a book. Deborah L. Jacobs is a lawyer, entrepreneur and award-winning journalist who has covered everything from travel to taxes. A former senior editor at Forbes, she has written for many national publications, including The New York Times, Bloomberg Wealth Manager and Businessweek. She is the author of Estate Planning Smarts, a bestselling guide for consumers, and Small Business Legal Smarts, geared to entrepreneurs. A graduate of Barnard and Columbia s Law School and Graduate School of Journalism, Jacobs now divides her time between New York and France.